Quite some time ago ABC was casting for a stunt show which was at the time called Mega Miniature Golf. Its closest description is a mix of ABC’s old stunt game Wipeout and miniature golf. The format went dormant for a while but it’s gearing up to tape, has a new name, and found its hosts. The show now goes under the title Holey Moley which we’re going to struggle writing or saying with a straight face. The show will be hosted by comedian Rob Riggle and sportscaster Joe Tessitore. The game cribs Wipeout‘s general idea of a larger than life stunt course played for laughs (as well as a cash prize), but this one will require contestants trying to navigate insane, one-of-a-kind courses and larger than life holes. 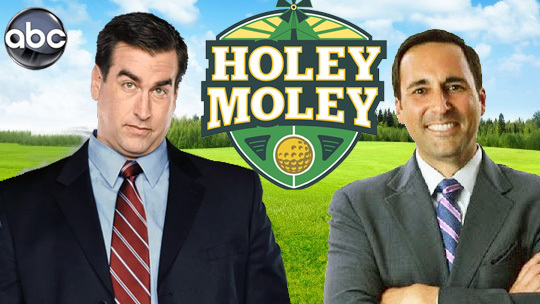 Holey Moley will record at Sable Ranch, home to Wipeout from 2008 to 2014, in early April. Unlike Wipeout, this show will allow an audience, so if you’re near Santa Clarita, CA, and want to see this show live, click here for tickets. We joke about the title, but the concept of a Wipeout / mini golf hybrid makes sense and seems fun so we’re curious and interested to see how this turns out.